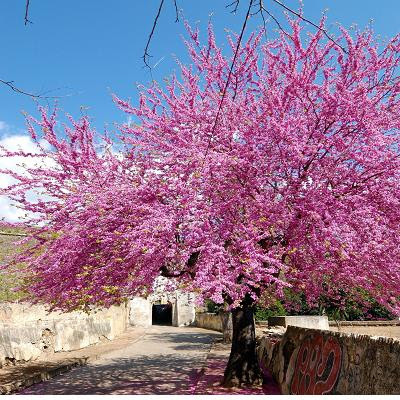 Otherwise known as the Judas tree or Love tree, Cercis siliquastrum is a small deciduous tree that was introduced to English gardens during the 16th century. Native to the South-Eastern Mediterranean and Western Asia region, it is likely to have arrived by way of silk road traders or soldiers returning from the last of the crusades. It was first named and described by Carl Linnaeus (1707 – 1778), the father of modern taxonomy. The common name 'Judas tree' refers to the belief that it was this species of tree that Judas Iscariot hanged himself from. However, may just be a corruption of the French common name 'Arbre de Judée', meaning 'tree of Judea'. Judea being the modern name of the mountainous, southern region of Palestine. Under favourable conditions, Cercis siliquastrum can be expected to grow to approximately 12 metres in height and with a width of 10 metre. The mid-green, broadly heart-shaped leaves are 10 cm in width, and appear shortly after the first flowers emerge. Clusters of rosy-lilac blooms cover the branches in May emerging on year-old or older growth, including the trunk! Unfortunately, in the flowers are prone to damage from late frosts and so plant in a sheltered position. In more northerly region plant against a south-facing wall and consider providing frost protection. The flowers are surprisingly edible and reportedly have a sweet-acid taste. 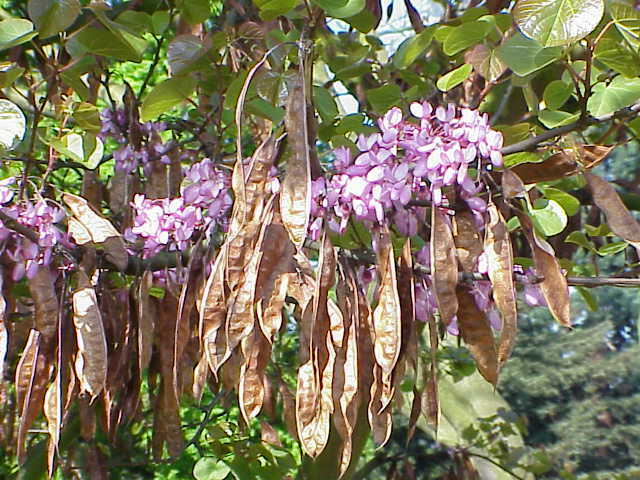 Once pollinated, green, purple-tinted seed pods appear from July onwards. Plant Cercis siliquastrum in late September to early May. Established specimen resent disturbance to roots so once planted avoid replanting or planting other shrubs, bedding etc close by. They will perform well in any good garden soil in a position that receives full sun. Cercis siliquastrum received the Award of Merit from the Royal Horticultural Society in 1984.